Can Vitamin D Affect Risk of Ulcerative Colitis Relapse? Serum levels of vitamin D of 35 ng/mL or less in patients with ulcerative colitis (UC) in clinical remission are associated with disease relapse, researchers report in the February issue of Clinical Gastroenterology and Hepatology. Increasing patients’ levels of vitamin D might reduce their risk for UC relapse. Receiver Operating Characteristic curve of serum vitamin D levels for the outcome of clinical relapse. Vitamin D is important for calcium homeostasis and bone metabolism, but there is increasing evidence that it also regulates immune responses. Mice deficient in vitamin D are more susceptible to colitis, and administration of vitamin D reduces their severity of colitis. Patients with IBD (Crohn’s disease in particular) are more likely to have vitamin D deficiency, and higher plasma levels of vitamin D have been associated with reduced risk for IBD, as well as reduced risk of cancer in patients with IBD. Vitamin D levels have been associated with other immune-mediated and chronic infections, such as infection with hepatitis B virus. 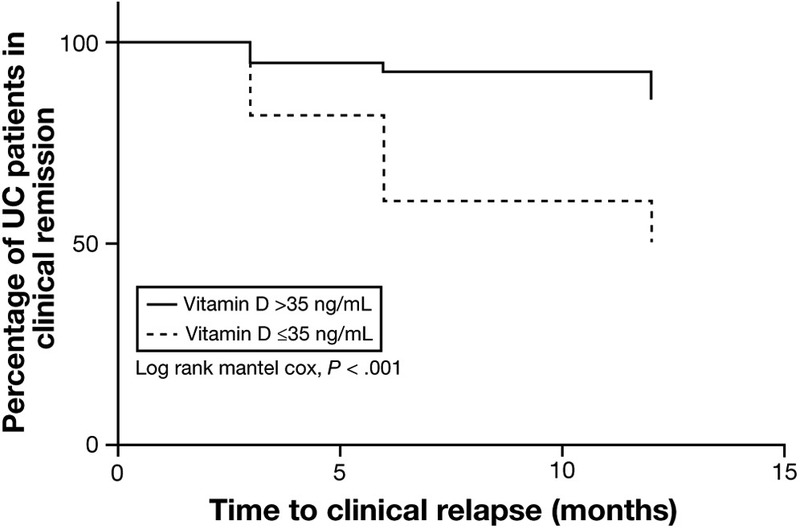 John Gubatan et al performed a prospective study of the association between vitamin D levels and risk of relapse in 70 patients with UC in clinical remission. The authors collected serum samples from patients when they underwent surveillance colonoscopy, and measured levels of 25-hydroxy-vitamin D. They also determined baseline endoscopic and histologic activity. 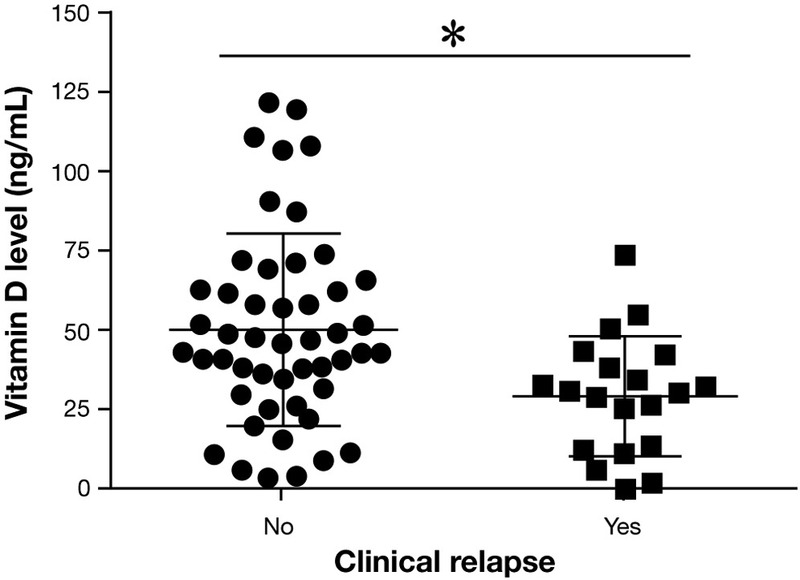 The primary outcome was rate of clinical relapse over the next 12 months. Gubatan et al chose a vitamin D cutoff level of 35 ng/mL or less, which they determined to have the greatest association for risk of clinical relapse based on univariate and multivariate analyses. They compared the risk of clinical relapse among patients with a vitamin D level of 35 ng/mL or less with risk in patients with a level greater than 35 ng/mL. To account for seasonal variations in vitamin D levels, they analyzed data during a low sunlight season (September–February) and a high sunlight season (March–August). The authors found the mean baseline vitamin D level was significantly lower in patients who later relapsed (29.5 ng/mL) than in those who did not (50.3 ng/mL). Serum vitamin D levels of 35 ng/mL or less predicted UC relapse with 70% sensitivity and 74% specificity. Twenty percent of patients with a vitamin D level of 35 ng/mL or less had a clinical relapse in the next 12 months compared with 9% of patients with a vitamin D level greater than 35 ng/mL. Patients with a vitamin D level of 35 ng/mL or less also had a shorter time to clinical relapse than patients with levels of vitamin D greater than 35 ng/mL. Univariate analysis associated increased risk of clinical relapse with a vitamin D level of 35 ng/mL or less (odds ratio, 1.26), steroid use in the past year (odds ratio, 1.46), and baseline histologic inflammation (odds ratio, 1.52). In a multivariate-effects model, a baseline vitamin D level of 35 ng/mL or less was associated with an increased risk of clinical relapse (odds ratio, 1.25), even after the authors adjusted for baseline histologic inflammation. Gubatan et al conclude that vitamin D level is a marker of UC activity, indicating inflammatory activity at the endoscopic and histologic level. They say that serum vitamin D levels might be used to detect inflammation in patients without significant clinical symptoms. The authors suggest that the immune-protective and anti-inflammatory properties of vitamin D protect against subsequent inflammation and clinical relapse. They say that the low level of vitamin D in the patients were not due to UC activity, because the patients enrolled in the study were in clinical remission. However, this was a small study and the patients might not represent the general population of patients with UC. The findings can be applied only to patients with UC in remission, and were based on a single measurement of serum vitamin D at time of enrollment. The study did not take into account the possibility of fluctuations over the course of 12 months. Gubatan et al state that vitamin D is an affordable, accessible, and relatively nontoxic supplement that might help maintain clinical remission in patients with UC. Clinical trials of vitamin D therapy should be considered to definitively establish its impact on UC outcomes. In an editorial that accompanies the article, Stephen Hanauer reminds readers that the mean vitamin D level in the entire cohort was 44 ng/mL, and 60% of the subjects were taking vitamin D supplements. A normal vitamin D level is considered to be 20–40 ng/mL in healthy individuals, and the 35 ng/mL cut-off level used in the study was within this range. Hanauer also mentions that in assessing the confidence intervals for risk of relapse at lower or higher vitamin D levels, there does not appear to be a dose–response effect in the odds ratios according to levels. Based on these findings, Hanauer says it would be premature to target a level of 35 ng/mL. He states that the best predictors of clinical relapse are still endoscopic and histologic markers of inflammation. Is it Safe to Undergo Endoscopy During Pregnancy?